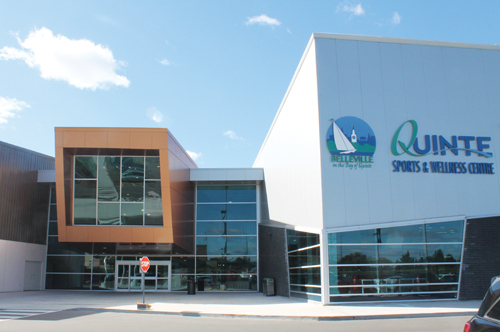 The expansion of the Quinte Sports & Wellness Centre in the city of Bellville (Ontario, Canada), is designed to do more than deliver heart-pounding exercise on state-of-the-art equipment—it also recaptures its own heat and uses it elsewhere in the facility. In a $35-million project that expanded the building to more than 300,000 square feet and added an artificial sports field to a nearby park, the facility is now capable of reclaiming heat in the process of making ice for one of the four ice surfaces and reusing it to heat spectator seating, snow melt pits, walkways, floors, sink and shower water, and air space. It is estimated that a total of 98 cents of every dollar used in the ice-making process is captured and reused. And if that’s not enough, waste heat is captured through the air-exchange system in the aquatic center, and a total of 95 cents of every dollar is effectively reused to heat the facility’s pools. • A state-of-the-art, competition-ready aquatic center containing three separate tanks and a second-floor, 300-seat viewing area. The facility was built to be accessible to all individuals, with ramp access provided for each pool, and water wheelchairs available for public use. The main pool is an eight-lane, 25-metre competition pool equipped with a diving board, starting blocks, and an electronic time clock. The shallow-water therapeutic pool offers a seated area with therapeutic jets. Heated to 92 degrees, the pool also includes stroke- and cardiac-maintenance programs. A preschool pool with numerous splash features and a beach entrance is available for children. Waste heat from the air in the aquatic center is reused to heat the pools. • Two new NHL-sized ice surfaces featuring floor-heated spectator seating for up to 300 and warm-spectator viewing complete with seating and a drink rail. Each arena contains five accessible, floor-heated dressing rooms to provide adequate space for rental groups. The arenas have also been designed with interchangeable benches, bench boards, and entrance ways to accommodate sledge-hockey groups. • A multi-use gymnasium with a rubberized floor that can accommodate basketball, badminton, volleyball, floor hockey, floor ball, pickle ball, and indoor soccer, plus a variety of other sports. The gym can also “double” as a reception hall, capable of seating more than 500 people, complete with a backroom plate-service area for catering companies. • Three training studios on the second floor. The Dryland Training Studio contains 30 pieces of cardio- and strength-training equipment for exercise, team training, and therapeutic use. This studio is fully accessible and offers equipment designed for wheelchair use. An aerobic studio looks out over the gymnasium and has a sprung hardwood floor to reduce stress on the joints of participants, while a yoga/Pilates studio provides a quiet, comfortable space for tranquil activities. Additional features include a heated, rubberized three-lane walking/running track, eight meeting rooms, a lounge, indoor courtyard area, cafe-style food services, and a pro shop. Perhaps another area of interest lies in the technology to protect patrons. Fitness equipment in the center. First, an enhanced emergency-alert system has been installed throughout the facility, which allows important emergency messages to be broadcast via TV screens and a PA system. Additionally, the center is outfitted with a Wellness Passport swipe-card system, which uses wall-mounted scanners to allow access to certain parts of the complex for those registered in programs or using facilities on a drop-in basis. And what about the 2,132 photovoltaic panels added to the roof? The panels produce energy year-round and divert it back into the energy grid, generating roughly $450,000 annually for the city. That’s a lot of hot air saved on the facility’s hockey penalty boxes! Information provided by Mark Fluhrer, direction of recreation, culture and community services for the city of Belleville. Reach him at mfluhrer@city.belleville.on.ca.